An artist's concept of a craggy piece of Solar System debris that belongs to a class of bodies called trans-Neptunian objects. Astronomers culling the data archives of NASA's Hubble Space Telescope have added 14 new TNOs to the catalog. 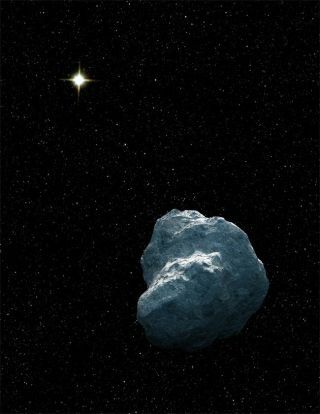 Astronomers have discovered a cache of 14 large space rocksbeyond the orbit of Neptune while sifting through archival observations fromthe Hubble Space Telescope. Icy rocks like the newfound objects are known as trans-Neptunianobjects because they typically reside outside Neptune's orbit. These objects include the former planet Pluto, now classified as a dwarf planet, as well as comets like thefamed Halley's comet. The newfound objects range from 25 to60 miles across (40 to 100 kilometers), said the researchers. Most trans-Neptunian objects arefaint and hard to spot. To find the new group, researchers searched throughHubble photos for the telltale streaks of light that images of these rocks leaveas they move through space during time-lapse exposures. After its initialsuccess, this method could reveal hundreds more trans-Neptunian objects overtime, hopeful scientists say. "Trans-Neptunian objectsinterest us because they are building blocks left over from the formationof the solar system," said study leader CesarFuentes of Northern Arizona University. These objects are similar toasteroids but lie farther from Earth. Asteroids generally orbit in the inner solarsystem, out to the orbit of Jupiter. This initial study examined only one-third of a squaredegree of the sky, meaning that there is much more area to survey, researcherssaid. Fuentes, who formerly was with theHarvard-Smithsonian Center for Astrophysics, said he and his colleaguesintend to continue their search for trans-Neptunian Objects. "We have proven our ability to detect and characterize TNOseven with data intended for completely different purposes," Fuentes said. The findingswill be described in an upcoming issue of the AstrophysicalJournal. The Pluto Debate: Planet or Plutoid?